Not to be confused with Ned Flanders. Edward Paul "Ed" Flanders (December 29, 1934 – February 22, 1995) was an American actor best known for his role as Dr. Donald Westphall in the television series St. Elsewhere. Flanders was born in Minneapolis, Minnesota, the son of Bernice (née Brown) and Francis Michael Grey Flanders. His mother was killed in an automobile accident when he was 14. After graduating from Patrick Henry High School (where he played hockey) in 1953, he enlisted in the United States Army, where he served as an X-ray technician. After his service with the United States Army ended, Flanders began his acting career on Broadway before moving on to guest parts in television series. From 1967 through 1975, Flanders appeared in more than a dozen American TV shows, including six appearances on Hawaii Five-O (as six different characters). During this time, he was also prolific in TV movies. He married actress Ellen Geer, with whom he had a son, Ian Flanders (born 1966) before they divorced. 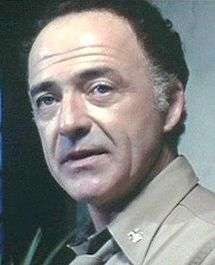 In the late 1970s, Flanders moved away from small TV roles to take major credits in both TV and feature films, while continuing his stage career. In 1974 Flanders won a Tony Award for Best Supporting or Featured Actor in a Dramatic Presentation for A Moon for the Misbegotten by Eugene O'Neill on Broadway. He also won an Emmy award in 1976 for the TV movie adaptation of A Moon for the Misbegotten. In 1982 he began his role in St. Elsewhere that was to earn him four Emmy Award nominations as Outstanding Lead Actor in a TV Series, winning the award in 1983. After a stormy departure from the series in 1987, he returned for two more episodes in 1988, including the series finale. During a scene in which Westphall addressed the staff, Flanders began speaking extemporaneously about the quality of art and had to be edited for broadcast. His exit on St. Elsewhere as a regular cast member was titled Moon for the Misbegotten after the play that won him a Tony Award. The episode gained much publicity as Westphall left the hospital after "mooning" his new boss, Dr. Gideon (played by Ronny Cox). Flanders continued his working relationship with executive producer Bruce Paltrow in the short-lived 1994 CBS series The Road Home. In addition to his six-year role as Dr. Donald Westphall, Flanders is noted as the actor who has played President Harry Truman more times, and in more separate productions, than any other. He portrayed Truman, who was president from April 1945 until January 1953, across the end of World War II and most of the Korean War in Truman at Potsdam, Harry S Truman: Plain Speaking, and MacArthur. In the last, Flanders had second billing to Gregory Peck's lead as General Douglas MacArthur. Flanders is one of a very short list of actors, including Jason Robards and Anthony Hopkins, who have portrayed two different presidents. See also this list of actors who played presidents. In feature films, Flanders performed major roles in two dark movies based on novels by William Peter Blatty. In the first, The Ninth Configuration (1980), he plays Col. Richard Fell, a self-effacing medic at a secret U.S. Army psychiatric facility who assists Marine psychiatrist Col. Vincent Kane (Stacy Keach). The film was based on Blatty's darkly satirical novel Twinkle, Twinkle, "Killer" Kane. In 1990, Flanders played Father Dyer alongside star George C. Scott in Blatty's The Exorcist III based on the novel Legion. One of Flanders's best-remembered TV guest roles was in the first season M*A*S*H episode "Yankee Doodle Doctor," playing film director Duane William Bricker, who is making a documentary about M*A*S*H units and comes to the 4077th on the recommendation of General Clayton. When Hawkeye and Trapper react to Bricker's filmmaking by destroying the negatives, Bricker abandons the project and leaves. Hawkeye takes over the making of the film, which, instead of a serious documentary, becomes a farce in the style of the Marx Brothers but maintaining a somber ending, which Gen. Clayton applauds. Flanders also played nationally known journalist William Allen White in the 1977 made-for-TV movie Mary White. This movie was based on the famous eulogy White wrote about his daughter after her death in 1922 from being hit in the head while riding her horse. He also appeared in the 1979 made-for-TV-horror-miniseries Salem's Lot as Dr. Bill Norton. He also played news anchor John Woodley in the 1983 made-for-TV suspense drama Special Bulletin, about a group of environmentalists who threaten to detonate a nuclear weapon in Charleston, South Carolina. After battling four divorces, a chronic back injury from a 1989 automobile accident, and a lifelong battle with depression, Flanders died from a self-inflicted gunshot wound on February 22, 1995 in Denny, California at the age of 60. He left behind three sons and a daughter. No suicide note was found. Flanders won the 1974 Tony Award for Best Supporting or Featured Actor in a Dramatic Presentation for his performance in A Moon for the Misbegotten by Eugene O'Neill, for which he also received the 1974 Drama Desk Award for Outstanding Performance. ↑ The Complete Directory to Prime Time Network and Cable TV Shows, 1946–Present. Ballantine Books. 2003. p. 1427. ISBN 0-345-45542-8.